Proclaim Trust is a registered charity. This non-profit making, interdenominational, organisation was established in 1999 to facilitate the work of Barry Woodward. Barry Woodward grew up in a great, non-Christian, home, in Salford, Greater Manchester. At 16, he left school with no qualifications and became drawn into the Manchester drugs scene, taking cannabis, amphetamines and LSD. This led to a life of heroin addiction and drug dealing. After being dependent on heroin for fifteen years and spending a number of terms in prison, Barry had what he describes as a 'religious experience', which resulted in his life being totally transformed. This led to him becoming an evangelist. Since then, he has worked with a number of Christian organizations and studied full time at Cliff College, where he was awarded a Diploma in Biblical Studies and Evangelistic Ministry from Sheffield University. Barry is a contemporary communicator who is humorous, passionate and inspirational. Each year, he speaks at approximately 130 events. He also occasionally contributes to discussions related to drug issues on the BBC, Channel 4 and Sky TV. Barry is an accredited travelling minister with the Assemblies of God denomination, in the UK, and is also an associate evangelist with J.John of the Philo Trust. He is author of 'Once an Addict', and he and his wife Tina are members of the Bridge Church, Bolton, Greater Manchester. The primary function of Proclaim Trust is to inspirationally communicate the message of hope throughout the United Kingdom. The Trust also equips people to engage in missional activities and mentors evangelists. In January 2010 Proclaim Trust started to develop a Religious Studies teacher’s resource. 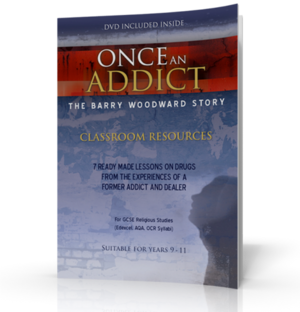 This resource consists of a 1 ½ hour DVD documentary version of Barry Woodward’s story called the ‘Once an Addict’ DVD and seven readymade lesson plans and worksheets, in the format of a 74 page, A4 size workbook. The Campaign To Educate (C2E) Schools Project was then launched. The aim of C2E is to send the ‘Once an Addict’ Classroom Resources for teachers to use free of charge to every secondary school in the UK. The purpose is to teach students in Years 9 – 11 about the dangers of drugs and drugs misuse, and also to teach them the Christian viewpoint on related issues, using Barry Woodward’s real life experiences as a foundation for the teaching.